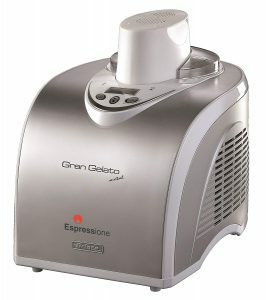 Espressione Ariete Gran Gelato 693 is a 2017 model modern and efficient, stylish and compact metal ice-cream maker with a 135-watt power efficient compressor and a liter capacity container. Most of the ratings are 5 stars by 9 different customers at the moment, let’s find out if it is worth the price tag at Amazon.com, less or more. 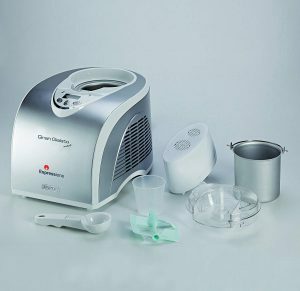 It is designed for making smooth and solid ice creams (cream and milk) and other healthy and tasty frozen desserts like frozen yogurt, soft serve ice-cream, gelato (milk, no cream), sorbet (fruit puree) or sherbet (fruit and milk) in just a matter of 30 to 40 minutes in your home or office kitchen. With a liter container it can make enough ice-cream for a few people in your family. You can see the LCD-backlit display panel with three control buttons and two light indicators, that is easy to operate. And you can view the time countdown and the current temperature on the display panel.It has some unique user-friendly features like auto-refrigerante that lets you make beautiful ice-cream at the optimal texture consistently in a very short period of time. The stainless steel basket is conveniently detachable and easy to clean. And you’ll find an ice-cream scoop and a measuring container in the box. The integrated compressor is a R134 type refrigerant (120 volts) that is compatible with the North American 110-120V standard outlets, is ozone safe, efficient and powerful that can work at a minimum temperature of -35 degrees. Metallic silver Espressione-Ariete Gran Gelato 693 is a brand of De’Longhi and has a beautiful sleek design that makes it easy on the eyes. It weighs 23.8 pounds as a heavy duty ice cream machine and measures 12 x 16 x 13 inches, is compact and won’t really occupy much space. You may want to dedicate a permanent space on your counter as you’ll probably find yourself using it all the time. It is a sturdy and durable, good quality product that is built to last, judging by the reviews online. It is designed in Italy but manufactured in China, like most home appliances these days. You can put fresh or frozen fruits or other ingredients like chocolate chips or nuts along with milk, cream and the standard stuff for making ice-cream. Please note that you can’t purchase the replacement items like an extra container via Amazon.com. But you’re welcome to contact the manufacturer on @ 201-439-1700 – the phone number given on the product page. Having a built-in compressor means you do not need to do any pre-freezing. If you want to make a soft-serve you just leave it on for 25 minutes or so, rather than 35-40 minutes. The timing will also depend on the milk and cream mix you use. It has a liter capacity container, which is still a fairly small batch and if you have any left, you can transfer it directly to the freezer. It makes all types of of healthy and delicious frozen desserts and we do not hesitate to recommend this product.